The 442nd Regiment is the most decorated unit in U.S. military history. Created as the 442nd Regimental Combat Team when it was activated February 1, 1943, the unit quickly grew to its fighting complement of 4,000 men by April 1943. During action in WWII, these 4,000 had to be replaced nearly two times, with a total of about 14,000 men served. The unit earned more than 18,000 awards in less than two years, including 9,486 Purple Hearts and 4,000 Bronze Star Medals. The unit was awarded eight Presidential Unit Citations (five earned in one month). :201 Twenty-one of its members were awarded Medals of Honor. In 2010, the Congressional Gold Medal was awarded to the 442nd Regimental Combat Team and associated units who served during WWII, and in 2012, all surviving members were made chevaliers of the French Légion d'Honneur for their actions contributing to the liberation of France and their heroic rescue of the Lost Battalion. Arriving in the European Theatre, the 442nd Regimental Combat Team, with its three infantry battalions, one artillery battalion and associated HQ and service companies, was attached to the 34th Infantry Division. On 11 June 1944, near Civitavecchia, Italy, the existing 100th Infantry Battalion, another all-Nisei fighting unit which had already been in combat since September 1943, was transferred from the 133rd Infantry Regiment to the 442nd Regimental Combat Team. Because of its combat record, the 100th was allowed to keep their original designation, with the 442nd renaming its 1st Infantry Battalion as its 100th Infantry Battalion. The related 522nd Field Artillery Battalion liberated at least one of the satellite labor camps of Dachau concentration camp and saved survivors of a death march near Waakirchen. The 442nd saw heavy combat during WWII, and was not inactivated until 1946, only to be reactivated as a reserve unit in 1947 and garrisoned at Fort Shafter, Hawaii. The 442nd lives on through the 100th Battalion/442nd Infantry Regiment, which has maintained an alignment with the active 25th Infantry Division since a reorganization in 1972. This alignment has resulted in the 100th/442nd Infantry Regiment's mobilization for combat duty in the Vietnam War and the Iraq War. With the 100th/442nd Infantry Regiment the last infantry unit in the Army Reserve, the 442nd's current members carry on the honors and traditions of the historical unit. Although the order did not refer specifically to people of Japanese ancestry, it was targeted largely for the internment of people of Japanese ancestry from the West Coast. In March 1942, Lieutenant General John L. DeWitt, head of the Western Defense Command and Fourth Army, issued the first of 108 military proclamations that resulted in the forced relocation from their residences to guarded relocation camps of more than 110,000 people of Japanese ancestry from the West Coast, the great majority of the ethnic community. Two thirds were born in the United States. In Hawaii, the military imposed martial law, complete with curfews and blackouts. As a large portion of the population was of Japanese ancestry (150,000 out of 400,000 people in 1937), internment was deemed not practical; it was strongly opposed by the island's business community, which was heavily dependent on the labor force of those of Japanese ancestry, unlike businesses on the mainland. There, business interests competed with those of Japanese Americans, and many bought up Japanese American properties that had to be surrendered. It was accurately believed that an internment of Japanese Americans and Japanese immigrants in Hawaii would have had catastrophic results for the Hawaiian economy; intelligence reports at the time noted that "the Japanese, through a concentration of effort in select industries, had achieved a virtual stranglehold on several key sectors of the economy in Hawaii." In addition, other reports indicated that those of Japanese descent in Hawaii "had access to virtually all jobs in the economy, including high-status, high-paying jobs (e.g., professional and managerial jobs)," suggesting that a mass internment of people of Japanese descent in Hawaii would have negatively impacted every sector of the Hawaiian economy. When the War Department called for the removal of all soldiers of Japanese ancestry from active service in early 1942, General Delos C. Emmons, commander of the U.S. Army in Hawaii, decided to discharge those in the Hawaii Territorial Guard, which was composed mainly of ROTC students from the University of Hawaii. However, he permitted the more than 1,300 Japanese-American soldiers of the 298th and 299th Infantry Regiment regiments of the Hawaii National Guard to remain in service. The discharged members of the Hawaii Territorial Guard petitioned General Emmons to allow them to assist in the war effort. The petition was granted and they formed a group called the Varsity Victory Volunteers, which performed various military construction jobs. General Emmons, worried about the loyalty of Japanese-American soldiers in the event of a Japanese invasion, recommended to the War Department that those in the 298th and 299th regiments be organized into a "Hawaiian Provisional Battalion" and sent to the mainland. The move was authorized, and on 5 June 1942, the Hawaiian Provisional Battalion set sail for training. They landed at Oakland, California on 10 June 1942 and two days later were sent to Camp McCoy, Wisconsin. On 15 June 1942, the battalion was designated the 100th Infantry Battalion (Separate)—the "One Puka Puka". Due in part to the actions of the 100th and the Varsity Victory Volunteers, the War Department directed that a Japanese-American Combat Team should be activated comprising the 442d Infantry Regiment, the 522d Field Artillery Battalion, and the 232d Engineer Combat Company. The order dated January 22, 1943, directed that, "All cadre men must be American citizens of Japanese ancestry who have resided in the United States since birth," and that "Officers of field grade and captains furnished under the provisions of subparagraphs a, b and c above, will be white American citizens. Other officers will be of Japanese ancestry insofar as practicable." In accordance with these orders the 442d Combat Team was activated February 1, 1943, by General Orders, Headquarters Third Army. Colonel Charles W. Pence took command, with Lieutenant Colonel Merritt B. Booth as executive officer. Lieutenant Colonel Keith K. Tatom commanded the 1st Battalion, Lieutenant Colonel James M. Hanley the 2d Battalion, and Lieutenant Colonel Sherwood Dixon the 3d Battalion. Lieutenant Colonel Baya M. Harrison commanded the 522d Field Artillery, and Captain Pershing Nakada commanded the 232d Engineers. Colonel Charles W. Pence, a World War I veteran and military science professor, commanded the regiment until he was wounded during the rescue of the "Lost Battalion" in October 1944. He was then replaced by Lieutenant Colonel Virgil R. Miller. The U.S. government required that all internees answer a loyalty questionnaire, which was used to register the Nisei for the draft. Question 27 of the questionnaire asked eligible males, "Are you willing to serve in the armed forces of the United States on combat duty, wherever ordered?" and question 28 asked, "Will you swear unqualified allegiance to the United States of America and faithfully defend the United States from any or all attack by foreign or domestic forces, and forswear any form of allegiance or obedience to the Japanese emperor, or any other foreign government, power or organization?" Nearly a quarter of the Nisei males answered with a no or a qualified answer to both questions in protest, resenting the implication they ever had allegiance to Japan; some left them blank. Qualified answers included those who said, yes, but criticized the internment of the Japanese or racism. Many who responded that way were imprisoned for evading the draft. Such refusal is the subject of the postwar novel No-No Boy. But more than 75% indicated that they were willing to enlist and swear allegiance to the U.S. The U.S. Army called for 1,500 volunteers from Hawaii and 3,000 from the mainland. An overwhelming 10,000 men from Hawaii volunteered. The announcement was met with less enthusiasm on the mainland, where the vast majority of draft-age men of Japanese ancestry and their families were held in internment camps. The Army revised the quota, calling for 2,900 men from Hawaii, and 1,500 from the mainland. Only 1,256 volunteered from the mainland during this initial call for volunteers. As a result, around 3,000 men from Hawaii and 800 men from the mainland were inducted. President Roosevelt announced the formation of the 442nd Infantry Regimental Combat Team, saying, "Americanism is not, and never was, a matter of race or ancestry." Ultimately, the draft was instated to obtain more Japanese Americans from the mainland and these made up a large part of the 14,000 men who eventually served in the 442nd Regiment. The 100th Infantry Battalion relocated to Camp Shelby in Mississippi. Eventually, the 100th was joined by 3,000 volunteers from Hawaii and 800 from the mainland camps. 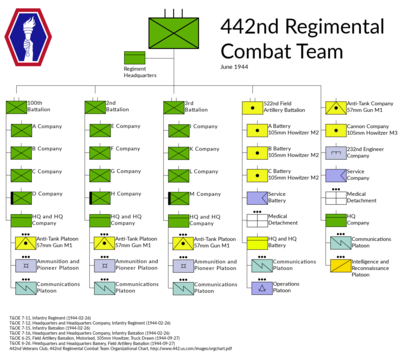 As a regimental combat team (RCT), the 442nd RCT was a self-sufficient fighting formation of three infantry battalions (originally 1st, 2nd, and 3rd Battalions, 442nd Infantry, and later the 100th Infantry Battalion in place of the 1st), the 522nd Field Artillery Battalion, the 232nd Engineer Company, an anti-tank company, cannon company, service company, medical detachment, headquarters companies, and the 206th Army Band. Although they were permitted to volunteer to fight, Americans of Japanese ancestry were generally forbidden to fight in combat in the Pacific Theater. No such limitations were placed on Americans of German or Italian ancestry, who were assigned to units fighting against the Axis Powers in the European Theater. There were many more German and Italian Americans than Japanese Americans, and their political and economic power reduced the restrictions against them. Many men deemed proficient enough in the Japanese language were approached, or sometimes ordered, to join the Military Intelligence Service (MIS) to serve as translators/interpreters and spies in the Pacific, as well as in the China Burma India Theater. These men were sent to the MIS Language School at Camp Savage, Minnesota to develop their language skills and receive training in military intelligence. While the 442nd trained in Mississippi, the 100th departed for Oran in North Africa to join the forces destined to invade Italy. The 442nd Combat Team, less its 1st Battalion, which had remained in the U.S. to train Nisei replacements after many of its members were levied as replacements for the 100th, sailed from Hampton Roads, Virginia, on 1 May 1944 and landed at Anzio on 28 May. The 442nd would join the 100th Battalion in Civitavecchia north of Rome on 11 June 1944, attached to the 34th Infantry Division. The 100th was placed under the command of the 442nd on 15 June 1944 but on 14 August 1944, the 100th Battalion was officially assigned to the 442nd as its 1st battalion, but was allowed to keep its unit designation in recognition of its distinguished fighting record. The 1st Battalion, 442nd Infantry at Camp Shelby was then redesignated the 171st Infantry Battalion (Separate) on 5 September 1944. The 100th Battalion's high casualty rate at Anzio and Monte Cassino earned it the unofficial nickname "Purple Heart Battalion." 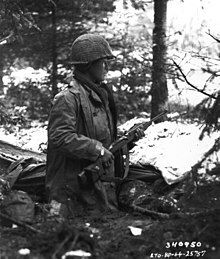 A 442nd RCT squad leader, Sergeant Inouya, checks for German units in France in November 1944. The newly formed Nisei unit went into battle together on 26 June 1944 at the village of Belvedere in Suvereto, Tuscany. Although the 100th was attached to the 442nd, their actions earned them a separate Presidential Unit Citation. Second and Third Battalions were the first to engage the enemy, in a fierce firefight. F Company bore the worst fighting. A, B, and C Companies of the 100th were called into combat and advanced east using a covered route to reach the high ground northeast of Belvedere. :34 The enemy did not know that the 100th was flanking the German exit, trapping them in Belvedere. C Company blocked the town's entrance while A Company blocked the exit. As this was occurring the 442nd's 2nd Battalion was receiving a heavy barrage by the Germans from inside Belvedere, and the Germans remained unaware of their situation. B Company stayed on the high ground and conducted a surprise attack on the German battalion's exposed east flank, forcing the Germans to flee and run into C Company, which then drove the Germans to A Company. The 442nd, along with its first battalion, the 100th, kept driving the enemy north, engaging in multiple skirmishes until they had passed Sassetta. The battle of Belvedere showed that the 442nd could hold their own and showed them the kind of fighting the 100th Battalion had gone through in the prior months. After only a few days of rest, the united 442nd again entered into combat on 1 July, taking Cecina and moving towards the Arno River. On 2 July, as the 442nd approached the Arno, 5th Battalion engaged in a hard-fought battle to take Hill 140, while on 7 July the 100th fought for the town of Castellina Marittima. 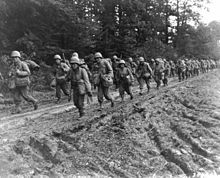 For the first three weeks of July the 442nd and its 1st Battalion, the 100th, were constantly attacking German forces, leading to 1,100 enemy killed and 331 captured. Hill 140 was the main line of enemy resistance. A single German battalion held the hill and, along with the help of artillery, had completely wiped out a machine-gun squad of L Company of the 3rd Battalion and G Company of 2nd Battalion except for its commander. :36 A constant barrage of artillery shells were launched against the 2nd and 3rd Battalions as they dug in at the hill's base. The 442nd gained very little ground in the coming days only improving their position slightly. The 232nd Engineers aided the 442nd by defusing landmines that lay in the 442nd's path. The entire 34th Division front encountered heavy resistance. "All along the 34th Infantry Division Front the Germans held more doggedly than at any time since the breakthrough at Cassino and Anzio. ":37 Hill 140 had been dubbed "Little Cassino" as the resistance by the Germans was so fierce. "Hill 140, when the medics were just overrun with all the casualties; casualties you couldn't think to talk about." The 2nd Battalion moved to the eastern front of Hill 140 and 3rd Battalion moved to the western front, both converging on the German flanks. It wasn't until 7 July when the last German resistance was taken down that the hill came under the 34th Division's control. On the day Hill 140 fell, the battle for the town of Castellina Marittima began. The 100th began its assault on the northwestern side of the town taking the high ground. Just before dawn, 2nd Platoon C Company moved into town, encountering heavy resistance and multiple counterattacks by German forces but held them off. In the meantime Company B moved north into Castellina, encountering heavy resistance as well. First they helped defend 2nd and 3rd Battalions in the taking of Hill 140. 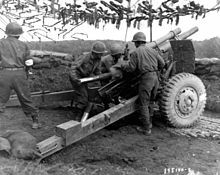 Then with the help of the 522nd Field Artillery, they lay down a heavy barrage and forced the Germans to retreat by 1800 hours on 7 July. :38 The 100th dug in and waited for relief to arrive after spending an entire day securing the town. Until 25 July, the 442nd encountered heavy resistance from each town when they reached the Arno River, ending the Rome-Arno Campaign. The 100/442 lost 1,272 men (17 missing, 44 non-combat injuries, 972 wounded, and 239 killed) in the process, a distance of only 40 miles (64 km). They rested from 25 July to 15 August, when the 442nd moved to patrol the Arno. Crossing the Arno on 31 August was relatively uneventful, as they were guarded the north side of the river in order for bridges to be built. On 11 September the 442nd was detached from the Fifth Army and then attached to the 36th Infantry Division of the Seventh Army. On 15 July the Antitank Company was pulled from the frontlines and placed with the 517th Parachute Infantry Regiment, 1st Airborne Task Force. They had trained at an airfield south of Rome to prepare for the invasion of Southern France which took place on 15 August, landing near Le Muy, France. They trained for a few weeks to get used to, prepare, properly load, and fly gliders. These gliders were 48 feet (15 m) long and 15 feet (4.6 m) high, and could hold a jeep and a trailer filled with ammunition, or a British six-pounder antitank gun. [dead link] The Southern France Campaign, 15 August to 14 September, led the 442nd to its second Presidential Unit Citation for invading in gliders and the Combat Infantryman Badge for fighting with the infantrymen of the 7th Army. The soldiers of Antitank Company received the Glider Badge. :56–57 After many rough landings by the gliders, hitting trees or enemy flak, they held their positions for a few days until relieved by Allied troops coming in by sea. For the next two months the Antitank Company guarded the exposed right flank of the Seventh Army and protected the 517th Parachute Infantry. The unit also cleared mines, captured Germans, and guarded roads and tunnels. In mid-to-late October, the Antitank Company rejoined the 442nd during the battle to find the "Lost Battalion." After leaving Naples, the 442nd landed in Marseille on 30 September and for the next few weeks they traveled 500 miles (800 km) through the Rhone Valley, by walking and by boxcar, until 13 October. On 14 October 1944 the 442nd began moving into position in the late afternoon preparing the assault on Hills A, B, C, and D of Bruyères. Each hill was heavily guarded, as each hill was key in order to take and secure the city. Hill A was located Northwest of Bruyères, Hill B to the North, Hill C Northeast, and Hill D to the East. The 442nd had experienced mainly prairie in Italy, but the Vosges Mountains provided a very different terrain. The unit faced dense fog, mud, heavy rain, large trees, hills, and heavy enemy gunfire and artillery while moving through the Vosges. Hitler had ordered the German frontline to fight at all costs as this was the last barrier between the Allied forces and Germany. On 15 October 1944 the 442nd began its attack on Bruyères. The 100th Battalion moved on Hill A, which was held by the SS Polizei Regiment 19, as 2nd Battalion moved in on Hill B. Third Battalion was left to take Bruyères. A team of Japanese-American G.I.s from the 522nd Field Artillery Battalion throw 105mm shells at Germans in support of an infantry attack in Bruyères, France. The 442nd initially took Hills C and D but did not secure them and they fell back into German hands. By noon of 19 October, Hill D was taken by 2nd and 3rd Battalions, who then were ordered to take a railroad embankment leaving Hill D unsecure. As the 100th began moving on Hill C on 20 October, German forces retook Hill D during the night. :57 The 100th Battalion was ordered back to Bruyères into reserve, allowing a German force onto Hill C, surprising another American division arriving into position. Retaking Hill C cost another 100 casualties. :62 Hill D fell back into Allied hands after a short time, finally securing the town. 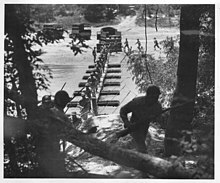 The 232nd Engineers had to dismantle roadblocks, clear away trees and clear mine fields all in the midst of the battle. :51,54 The 100th rested, then was called to the battle for Biffontaine. The 100th was ordered to take the high-ground but was eventually ordered to move into the town, leading to a bitter fight after the 100th were encircled by German forces: cut off from the 442nd, outside radio contact, and outside artillery support. 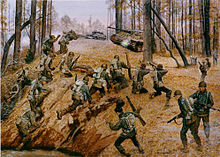 The 100th were in constant battle from 22 October until dusk of 23 October, engaging in house to house fighting and defending against multiple counterattacks. 3rd Battalion of the 442nd reached the 100th and helped drive out the remaining German forces, handing Biffontaine to the 36th. :182,183 On 24 October the 143rd Infantry of the 36th Division relieved the 100th and 3rd Battalion who were sent to Belmont, another small town to the north, for some short-lived rest. :139 Nine days of constant fighting continued as they were then ordered to save T-Patchers, the 141st Regiment of the 36th Infantry, the "Lost Battalion." After less than two days in reserve, the 442nd was ordered to attempt the rescue of the "Lost Battalion" two miles east of Biffontaine. :139 On 23 October Colonel Lundquist's 141st Regiment, soon to be known as the "Alamo" Regiment, began its attack on the German line that ran from Rambervillers to Biffontaine. Tuesday morning, 24 October, the left flank of the 141st, commanded by Technical Sergeant Charles H. Coolidge, ran into heavy action, fending off numerous German attacks throughout the days of 25 and 26 October. The right flank command post was overrun and 275 men of Lieutenant Colonel William Bird's 1st Battalion Companies A, B, C, and a platoon from Company D were cut off 2 kilometres (1.2 mi) behind enemy lines. :61–62 The "Lost Battalion" was cut off by German troops and was forced to dig in until help arrived. It was nearly a week before they saw friendly soldiers. At 4 a.m. on Friday 27 October, General John E. Dahlquist ordered the 442nd to move out and rescue the cut-off battalion. The 442nd had the support of the 522nd and 133rd Field Artillery units but at first made little headway against German General Richter's infantry and artillery front line. :66 For the next few days the 442nd engaged in the heaviest fighting it had seen in the war, as the elements combined with the Germans to slow their advance. Dense fog and very dark nights prevented the men from seeing even twenty feet. Many men had to hang onto the man in front of him just to know where to go. Rainfall, snow, cold, mud, fatigue, trench foot, and even exploding trees plagued them as they moved deeper into the Vosges and closer to the German frontlines. :185,187 The 141st continued fighting—in all directions. When we realized we were cut off, we dug a circle at the top of the ridge. I had two heavy, water-cooled machine guns with us at this time, and about nine or ten men to handle them. I put one gun on the right front with about half of my men, and the other gun to the left. We cut down small trees to cover our holes and then piled as much dirt on top as we could. We were real low on supplies, so we pooled all of our food. Airdrops with ammo and food for the 141st were called off by dense fog or landed in German hands. Many Germans did not know that they had cut off an American unit. "We didn't know that we had surrounded the Americans until they were being supplied by air. One of the supply containers, dropped by parachute, landed near us. The packages were divided up amongst us. ":83 Only on 29 October was the 442nd told why they were being forced to attack the German front lines so intensely. The fighting was intense for the Germans as well. Gebirgsjäger Battalion 202 from Salzburg was cut off from Gebirgsjager Battalion 201 from Garmisch. :72 Both sides eventually rescued their cut-off battalions. As the men of the 442nd went deeper and deeper they became more hesitant, until reaching the point where they would not move from behind a tree or come out of a foxhole. However, this all changed in an instant. The men of Companies I and K of 3rd Battalion had their backs against the wall, but as each one saw another rise to attack, then another also rose. Then every Nisei charged the Germans screaming, and many screaming "Banzai! ":83 Through gunfire, artillery shells, and fragments from trees, and Nisei going down one after another, they charged. A Japanese-American unit moves out of its old command post. The unit, Company F, 2nd Battalion, 442nd Regimental Combat Team, is holding a section of the front lines near St. Die Area, France, 13 November 1944. As the division commander, General Dahlquist's utilization of the 442nd received mixed reviews, chiefly from the unit's officers who believed that Dahlquist considered their Nisei soldiers to be expendable cannon fodder. Despite examples of ostensibly courageous behavior, his decisions were undermined by the failure to tally victories without considerable costs. A particular example was when his aide Lieutenant Wells Lewis, the eldest son of novelist Sinclair Lewis, was killed while Dahlquist was issuing orders standing in the open during a battle. :82 When Dahlquist ordered the 442nd to take Biffontaine, it was despite the sparsely populated farming town being militarily insignificant, out of the range of artillery and radio contact. In another example, Lieutenant Allan M. Ohata was ordered to charge with his men up a hill toward the enemy, who were dug in and well supplied. Ohata considered the order a certain suicide mission. Despite the threat of court-martial and demotion he refused, insisting that the men would be better off attacking the position "their own way. ":190 Lt. Ohata's Distinguished Service Cross, for his actions in Italy as a Staff Sergeant, was ultimately upgraded to the Medal of Honor. Following the tough battle through the Vosges Mountains, the 442nd was sent to the Maritime Alps and the French Riviera. It was a walk in the park compared to what they had experienced in October. Little to no action occurred in the next four months as they rested. The 442nd guarded and patrolled a twelve to fourteen-mile front line segment of the French-Italian border. This part of the 442nd's journey gained the name "Champagne Campaign" because of the available wine, women, and merry times. The 442nd experienced additional losses as patrols sometimes ran into enemy patrols, or sometimes soldiers stepped on enemy and allied land mines. Occasionally, soldiers of the 442nd captured spies and saboteurs. The 442nd also captured an enemy submarine. A Nisei soldier noticed what looked like an animal in the water but upon closer look it was actually a one-man German midget submarine. The German and the submarine were captured and handed over to the U.S. Navy. On 23 March 1945, the 442nd Regimental Combat Team sailed back to Italy and returned to the Gothic Line. From 20 to 22 March, the 442 and the 232 shipped off to Italy from France but the 522nd Field Artillery Battalion was sent to another part of Europe. They traveled northwards some 600 miles (970 km) through the Rhone Valley and stopped at Kleinblittersdorf on the east bank of the Saar River. The 522nd aided the 63rd Division on the Siegfried Line defenses south of St. Ingbert from 12–21 March. :99 The 522nd became a roving battalion, supporting nearly two dozen army units along the front traveling a total of 1,100 miles (1,800 km) across Germany and accomplishing every objective of their fifty-two assignments. :239 The 522nd was the only Nisei unit to fight in Germany. On 29 April scouts of the 522nd located a satellite camp of the infamous Dachau concentration camp next to the small Bavarian town of Lager Lechfeld, adjacent to Hurlach. 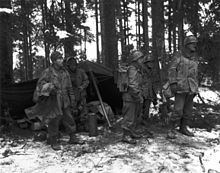 Scouts from the 522nd were among the first Allied troops to release prisoners from the Kaufering IV Hurlach satellite camp, one of nearly 170 such camps, where more than 3,000 prisoners were held. As we came around the way, there were a lot of Jewish inmates coming out of the camp, and I heard that the gate was opened by our advanced scouts. They took a rifle and shot it. I think it was a fellow from Hawaii that did that. I think it was a Captain Taylor, Company B was one of them, but another person from Hawaii, he passed away. They opened the gate and all these German, I mean, Jewish victims were coming out of the camp. Then, when we finally opened the Dachau camp, got in, oh those people were so afraid of us, I guess. You could see the fear in their face. But eventually, they realized that we were there to liberate them and help them. They were all just skin and bones, sunken eyes. I think they were more dead than they were alive because they hadn't eaten so much because, I think, just before we got there the S.S. people had all pulled back up and they were gone. But, we went there, and outside of the camps there were a lot of railroad cars there that had bodies in them. I had the opportunity to go into the camp there, but you could smell the stench. The people were dead and piled up in the buildings, and it was just unbelievable that the Germans could do that to the Jewish people. I really didn't think it was possible at all actually. The only thing the Nisei could really do was give them clothing and keep them warm. Nisei soldiers began to give the Jewish inmates food from their rations but were ordered to stop because the food could overwhelm the digestive systems of the starved inmates and kill them. 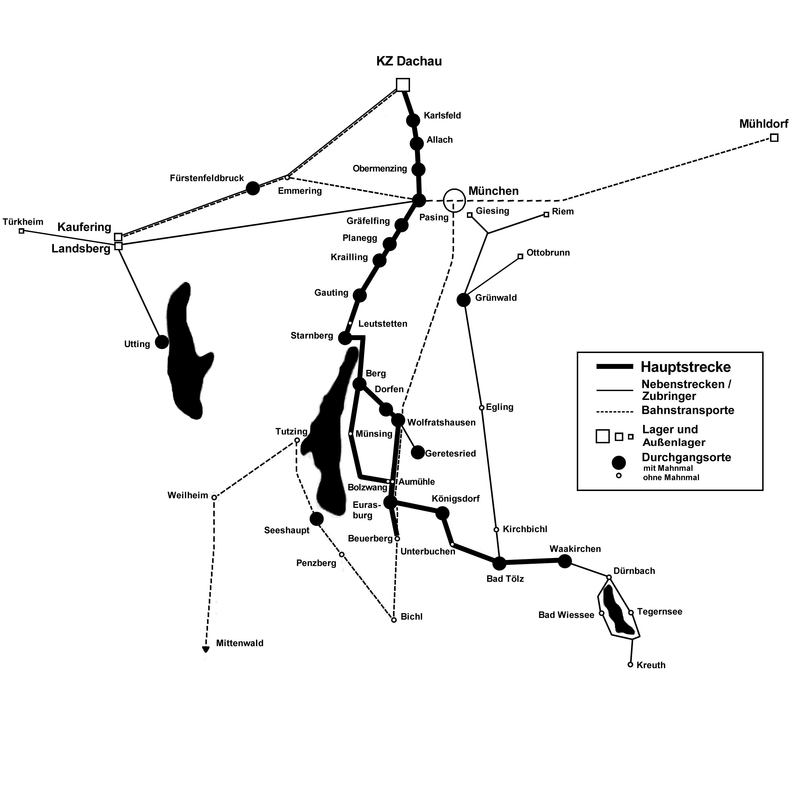 As they continued past the subcamp, they discovered the eastward path along which Jewish inmates were approaching Waakirchen, as the concentration camp survivors had been driven on a death march to another camp from Dachau starting there on 24 April, headed south through Eurasburg, then eastwards for a total distance of nearly sixty kilometers (37 miles), originally numbering some 15,000 prisoners. No, my first encounter was these lumps in snow, and then I didn't know what they were, and so I went and investigated them and discovered that they were people, you know. Most of them were skeletons or people who had been beaten to death or just died of starvation or overworked or whatever. Most of them I think died from exposure because it was cold. They discovered more subcamps and former inmates wandering the countryside. Following the German surrender, from May to November, the 522nd was assigned to security around Donauwörth, which consisted of setting up roadblocks and sentry posts to apprehend Nazis who were trying to disappear. The 522nd returned to the United States in November 1945.:99 A memorial to the rescue by the 522nd on May 2, 1945, exists at 47°46′6.15″N 11°38′55.30″E﻿ / ﻿47.7683750°N 11.6486944°E﻿ / 47.7683750; 11.6486944, just under two kilometers west of the Waakirchen town centre. On the Italian Front, the 442nd had contact with the only segregated African-American active combat unit of the U.S. Army in Europe, the 92nd Infantry Division, as well as troops of the British and French colonial empires (West and East Africans, Moroccans, Algerians, Indians, Gurkhas, Jews from the Palestine mandate) and the non-segregated Brazilian Expeditionary Force which had in its ranks ethnic Japanese. In front of the 442nd lay mountains code-named Georgia, Florida, Ohio 1, Ohio 2, Ohio 3, Monte Cerreta, Monte Folgorito, Monte Belvedere, Monte Carchio, and Monte Altissimo. These objectives hinged on surprising the Germans. The 100th went after Georgia Hill and the 3rd Battalion attacked Mount Folgorita. On 3 April the 442nd moved into position under the cover of nightfall to hide from the Germans who had good sight lines from their location on the mountains. The next day the 442nd waited. At 0500 the following morning they were ready to strike. A little over 30 minutes later objectives Georgia and Mount Folgorita were taken, cracking the Gothic Line. They achieved surprise and forced the enemy to retreat. After counterattacking, the Germans were defeated. During this time, 2nd Battalion was moving into position at Mount Belvedere, which overlooked Massa and the Frigido River. The 442nd made a continuous push against the German Army and objectives began to fall: Ohio 1, 2, and 3, Mount Belvedere on 6 April by 2nd Battalion, Montignoso 8 April by 3rd Battalion, Mount Brugiana on 11 April by 2nd Battalion, Carrara by 3rd Battalion on 11 April, and Ortonovo by the 100th on 15 April. The 442 turned a surprise diversionary attack into an all-out offensive. The advance came so quickly that supply units had a hard time keeping up. The Nisei drove so hard that beginning on 17 April the Germans decided to destroy their fortifications and pull back to make a final stand at Aulla. The last German defense in Italy was Monte Nebbione, directly south of Aulla. San Terenzo lay East of Mount Nobbione and became the launching point for the Aulla assault. The final drive of the 442nd began on 19 April and lasted until 23 April, when the 3rd Battalion finally took Mount Nebbione and Mount Carbolo. Following the fall of San Terenzo, 2nd Battalion hooked right around the mountains and Task Force Fukuda (consisting of Companies B and F from 2nd Battalion) flanked left from Mount Carbolo creating a pincer move onto Aulla. :117 On 25 April Aulla fell and the German retreat was cut off. In the days that followed, Germans began to surrender in the hundreds and thousands to the Fifth and Eighth Armies. This was 442nd's final World War II action. On 2 May the war ended in Italy followed six days later by Victory in Europe. President Truman salutes the colors of the combined 100th Battalion, 442nd Infantry, during the presentation of the seventh Presidential Unit Citation. The Regimental Combat Team (less the 552d Field Artillery Battalion) received the Presidential Unit Citation for outstanding accomplishments in combat in the vicinity of Serravezza, Carrara, and Fosdinovo, Italy, from 5 April to 14 April 1945. Sadao Munemori was posthumously awarded the Medal of Honor after he sacrificed his life to save those of his fellow soldiers. He was the only Japanese American to be awarded the Medal of Honor during or immediately after World War II. President Barack Obama and his guests applaud after signing S.1055, a bill to grant the Congressional Gold Medal. On 5 October 2010, the Congressional Gold Medal was awarded to the 442nd Regimental Combat Team, the 100th Infantry Battalion, and Nisei serving in the Military Intelligence Service. Pearl Harbor (July 2, 2014). Adm. Harry Harris Jr., commander of the U.S. Pacific Fleet, thanks Ralph Tomei, a 442nd Regimental Combat Team veteran, for his contributions during World War II. Tomei represented his friend Shiro Aoki as Rear Adm. Anne Cullere, commander in chief of French forces in the Pacific, presented him with the French Nation Order of the Legion of Honor aboard the French Floréal-class frigate FS Prairial. For more than a decade the government of France has presented the Legion of Honor to U.S. veterans who participated in the liberation of France during World War II. In 2012, the surviving members of the 442nd RCT were made chevaliers of the French Légion d'Honneur for their actions contributing to the liberation of France during World War II and their heroic rescue of the Lost Battalion outside of Biffontaine. Go for broke! Four Four Two! And victory will be ours. 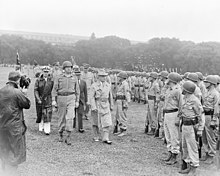 President Truman walks past members of the 442nd Regimental Combat Team as they stand at attention on the Ellipse. The record of the Japanese Americans serving in the 442nd and in the Military Intelligence Service (U.S. Pacific Theater forces in World War II) helped change the minds of anti-Japanese American critics in the U.S. and resulted in easing of restrictions and the eventual release of the 120,000-strong community well before the end of World War II. However, the unit's exemplary service and many decorations did not change the attitudes of the general U.S. population to people of Japanese ancestry after World War II. Veterans were welcomed home by signs that read "No Japs Allowed" and "No Japs Wanted", denied service in shops and restaurants, and had their homes and property vandalized. On July 15, 1946, the 442nd Regiment marched down Constitution Avenue to the Ellipse south of the White House. President Truman gave a speech and honored the regiment by awarding them with the Presidential Unit Citation. The American Legion refused to allow Nisei veterans into their group and removed Japanese-American soldiers from their honor rolls. It was not until Caucasian officers from the 442nd regiment intervened that the Legion began to accept Nisei veterans into the organization. Many Nisei veterans had difficulty finding houses in the United States. Their homes were occupied with new tenants. Due to the housing shortage, many Nisei veterans resorted to using federal housing programs. Many Nisei veterans used the G.I. Bill as an opportunity to attend university. Many Nisei became doctors, dentists, architects, scientists, and engineers. Anti-Japanese sentiment remained strong into the 1960s, but faded along with other once-common prejudices, even while remaining strong in certain circles. Conversely, the story of the 442nd provided a leading example of what was to become the controversial model minority stereotype. According to author and historian Tom Coffman, men of the 442nd dreaded returning home as second-class citizens. In Hawaii these men became involved in a peaceful movement. It has been described as the 442nd returning from the battles in Europe to the battle at home. The non-violent revolution was successful and put veterans in public office in what became known as the Revolution of 1954. One notable effect of 442nd's service was to help convince Congress to end its opposition towards Hawaii's statehood petition. Twice before 1959, residents of Hawaii asked to be admitted to the U.S. as the 49th state. The exemplary record of the Japanese Americans serving in the 442nd and the loyalty showed by the rest of Hawaii's population during World War II allowed Hawaii to be admitted as the 50th state (Alaska was granted statehood just prior). Soldiers of E Company, 100th Battalion, 442nd Infantry prepare to clear the "shoot house" while training in Hawaii in 2011. The 442nd RCT was inactivated in Honolulu in 1946, but reactivated in 1947 in the U.S. Army Reserve. It was mobilized in 1968 to refill the Strategic Reserve during the Vietnam War, and carries on the honors and traditions of the unit. Today, the 100th Battalion, 442nd Infantry, is the only ground combat unit of the Army Reserve. The battalion headquarters is at Fort Shafter, Hawaii, with subordinate units based in Hilo, American Samoa, Saipan, and Guam. The only military presence in American Samoa consists of the battalion's B and C companies. In August 2004, the battalion was mobilized for duty in Iraq. Stationed at Logistics Support Area Anaconda in the city of Balad, which is located about 50 miles northwest of Baghdad. Lt. Colonel Colbert Low assumed command of the battalion only a few weeks after the battalion arrived at Logistical Support Area Anaconda. In early 2006, the 100th had returned home. One soldier was killed by an improvised explosive device attack. Four members of the battalion were killed in action, and several dozen injured, before the battalion returned home. During the year-long deployment, one of Charlie Company's attached platoons, discovered over 50 weapons caches. Unlike the soldiers of World War II who were predominantly Japanese Americans, these soldiers came from as far away as Miami, Florida, Tennessee, Alaska and included soldiers from Hawaii, Philippines, Samoa and Palau. For their actions in Iraq the unit received the Meritorious Unit Commendation. The interchange between the I-105 and I-405 freeways in Los Angeles is labeled the Sadao S. Munemori Memorial Interchange. A nationwide campaign to urge the U.S. Postal Service to issue a commemorative postage stamp to honor the contributions of the Japanese American soldiers of World War II was begun in 2006 in California. The unit was once again deployed in 2009. The unit was called up alongside the 3rd brigade, 25th Infantry Division; and was assigned as an element of the 29th Infantry Brigade Combat Team. Nominally deployed to Kuwait, it conducted patrols into Iraq, leading to two fatalities; those patrols consisted of more than a million miles of driving conducting convoy duty. During the units deployment, several dozen of the units American Samoan servicemembers became naturalized U.S. citizens while in Kuwait. Takashi "Halo" Hirose, first Japanese American to represent the United States in any international swimming competition, and the first to set a swimming world record. He set that record in 1938 as a member of the United States' 4 × 100 m freestyle relay team. 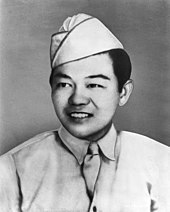 Daniel Inouye lost his right arm to a grenade wound and received several military decorations, including the Medal of Honor. He would later become the highest-ranking Asian-American politician in U.S. history. 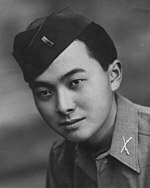 Daniel Inouye, U.S. Representative from Hawaii (1959–62); U.S. Senator from Hawaii (1962–2012); President pro tempore of the Senate (2010–12); awarded the Medal of Honor and Purple Heart. Inouye wanted to become a surgeon before he lost his right arm. Isao Kikuchi, graphic designer, illustrator, carver, and painter. Illustrated Welcome Home Swallows and Blue Jay in the Desert. Colonel Young-Oak Kim, the only Korean American officer during his service in 442nd Infantry. First officer from an ethnic minority to command a U.S. Army combat battalion. Allegiance the Musical: This musical, about the challenges faced by a Japanese-American family, is set in the present day with flashbacks to the 1940s. It was inspired by the experiences of George Takei, who spent his childhood in internment camps. It stars George Takei, Lea Salonga and Telly Leung. American Pastime: This 2007 fictional film depicts life inside the internment camps, where baseball was one of the major diversions from the reality of the internees' lives. Location scenes were filmed in bleak, desolate land, not far from the site of an actual camp. Lane Nomura, the oldest son enlists in the Army, as a member of the 442nd Regimental Combat Team. The unit motto, "Go for broke! ", provides inspiration at a climactic moment, and reference is made to the losses taken by the 442nd during the rescue of the Lost Battalion. Go for Broke! : This 1951 film dramatizes the lives and wartime heroics of the 442nd Regimental Combat Team. The film stars Van Johnson as a young officer, reluctant about his assignment to the 442nd. He comes to respect the Nisei troops, eventually refusing a transfer back to his original Texas unit. The movie starred a number of veterans of the 442nd. It can be found on iTunes. The "One Puka Puka" episode of The Gallant Men television series featured the unit with guest stars Poncie Ponce and George Takei. The James Michener novel Hawaii has a chapter detailing the 442nd's experiences, although its designation is changed to the 222nd and many of the members appear under fictionalized names. Ed Sakamoto wrote a play about the 100th/442nd entitled Our Hearts Were Touched by Fire, which was performed in Honolulu and Los Angeles. In the series of four Karate Kid movies, Keisuke Miyagi is a main character portrayed as a World War II veteran who had fought in the 442nd and received the Medal of Honor. The fourth film, The Next Karate Kid, begins with a reunion of the 442nd, in which Sen. Daniel Inouye gives a speech and Mr. Miyagi wears his Medal of Honor for the only time in any of the four films. The Nisei Project: In 2001, choreographer Marla Hirokawa premiered her "Nisei" ballet in Brooklyn, NY which was inspired by her late father, 100th Battalion veteran and gave honor to the men of the 100th/442nd. In 2003, Marla and sister Laurie Hamano produced a "Nisei" ballet tour across the Hawaiian Islands. (Lane Nishikawa toured and performed with the dance company.) In 2014, "Nisei" was re-staged and presented at the NY International Fringe Festival with a revised score that included songs about the Nisei veterans composed by ukulele virtuoso Jake Shimabukuro and singer/songwriter Harold Payne. In 2005, Lane Nishikawa directed and starred in the independent film, Only the Brave, which is a fictional account of the rescue of the Lost Battalion. "Family 8108", the 9 December 2007 episode of the CBS TV show Cold Case centers around the Japanese internment camps and discusses the 442nd Regional Combat Team. Ken Burns' 2007 PBS World War II documentary The War explores the stories of four American towns' experiences with the war. Burns' 15-hour documentary goes in depth in describing the many battles of World War II, including those of the 442nd Infantry Regiment. 99 Years of Love 〜Japanese Americans〜: In 2010 TBS produced a five-part, 10-hour fictional Japanese-language miniseries featuring many of the major events in Japanese-American history. Episode 4 features a key character who serves in the 442nd and portrays the rescue of the Texas Battalion. Captain America: The First Avenger (2011) features Kenneth Choi as the character of Jim Morita, a Nisei soldier separated from his unit that joins with Dum Dum Dugan and the Howling Commandos. Choi again reprised the role in an episode of Agents of S.H.I.E.L.D. Valor With Honor is an 85-minute independent documentary film on the last interviews of veterans of the 442nd Regimental Combat Team. Interviews, war footage, and photos are part of the un-narrated documentary. In Drunk History season 2 episode 15 "Hawaii", Phil Hendrie tells the story of Daniel Inouye of the 442nd Infantry Regiment enlisting after the Japanese American ban is lifted and later losing his arm in the assault on Colle Musatello in Italy. In Hawaii Five-0 season 4 episode 10, the brother of the suspect whose family was placed in an internment camp is shown as a member of the battalion. It gives some information about the battalion and states that his brother who was of age did not want to stay in the camp, so he joined the Army in that battalion as did many of the other boys who were of age. The story of the 442nd Infantry Regiment appeared in an episode of the American Heroes Channel series What History Forget, entitled "Fighting for Freedom". The episode featured an interview with Susumu Ito that was shot shortly before his death in 2015. Go for Broke: An Origin Story (2018) follows a group of University of Hawaii ROTC students during the tumultuous year after the attack on Pearl Harbor, as they navigate wartime Hawaii and fight discrimination. Adaptation of the comic book by Stacey Hayashi. ^ "Colors and Insignia". 100th Infantry Battalion Veterans. Retrieved 4 March 2018. ^ "442nd Regimental Combat Team Historical Society Website". ^ a b c d "100th Battalion, 442nd Infantry". GlobalSecurity.org. 23 May 2005. Archived from the original on 11 September 2008. Retrieved 27 September 2008. ^ a b Shenkle, Kathryn (May 2006). "Patriots under Fire: Japanese Americans in World War II". United States Department of Defense, Department of the Army, Center of Military History. Archived from the original on 23 June 2013. Retrieved 6 June 2014. ^ a b c Asahina, Robert (2007). Just Americans: How Japanese Americans Won a War at Home and Abroad. Penguin Group USA. ISBN 978-1-59240-300-4. ^ a b Steffen, Jordan (6 October 2010). "White House honors Japanese American WWII veterans". The Los Angeles Times. Archived from the original on 7 October 2010. Retrieved 9 October 2010. ^ a b "The French Legion of Honor Awarded to the 442nd Regimental Combat Team". Archived from the original on 30 January 2015. Retrieved 30 January 2015. ^ Crost, Lyn. Honor by Fire: Japanese Americans at War in Europe and the Pacific. Novata: Presidio Press, 1994. Pg. 147. ^ Helmly, James R. (October 2006). "Changing to a 21st–century Army Reserve". ARMY Magazine. United States Army: 108. ^ Wakamatsu, Peter. "Origins of the 442nd Regimental Combat Team". the442.org. Retrieved 4 March 2018. ^ a b c d e f g h i j Shirey, Orville (1946). Americans: The Story of The 442d Combat Team. Washington Infantry Journal Press. ISBN 978-1258423360. ^ Crost, Lyn (1997). Honor by Fire: Japanese Americans at War in Europe and the Pacific. Presidio Press. ISBN 978- 0891415213. ^ Bangarth, Stephanie Danielle (2008). Voices Raised in Protest: Defending Citizens of Japanese Ancestry in North America, 1942-49. UBC Press. p. 29. ISBN 978-0-7748-5824-3. ^ "442nd Regimental Combat Team | Densho Encyclopedia". encyclopedia.densho.org. Retrieved 2018-12-02. ^ "Military Intelligence Service | Densho Encyclopedia". encyclopedia.densho.org. Retrieved 2018-12-02. ^ Williams, Rudi (25 May 2000). "The "Go for Broke" Regiment Lives Duty, Honor, Country". American Forces Press Service. Archived from the original on 14 July 2012. ^ Duus, Masayo Umezawa (2006). Unlikely Liberators: The Men of the 100th And 442nd. University of Hawaii Press. ISBN 978-0-8248-3140-0. ^ a b c d e f Crost, Lyn (1994). Honor by Fire: Japanese Americans at War in Europe and the Pacific. Presidio. ISBN 978-0-89141-521-3. ^ a b McCaffrey, James M. (2013). Going for Broke: Japanese American Soldiers in the War against Nazi Germany. University of Oklahoma Press. ISBN 978-0-8061-8908-6. ^ Go For Broke National Education Center video archive. Harry Abe, Film #348, Tape 2, 28:00 min. ^ a b "Go For Broke National Education Center - Preserving the Legacy of the Japanese American Veterans of World War II". Goforbroke.org. Archived from the original on 13 August 2012. Retrieved 17 August 2012. ^ a b c d e f g h i j k l Sterner, C. Douglas (2007). Go for Broke: The Nisei Warriors of World War II who Conquered Germany, Japan, and American Bigotry. American Legacy Media. ISBN 978-0-9796896-1-1. ^ "Southern France Campaign". Go For Broke National Education Center. Archived from the original on 22 October 2012. Retrieved 17 August 2012. ^ Video: Armistice Day In France Etc. (1944). Universal Newsreel. 1944. Retrieved 21 February 2012. ^ a b c d e f g Steidl, Franz (30 December 2008). Lost Battalions: Going for Broke in the Vosges, Autumn 1944. Novato: Presidio. ISBN 978-0-307-53790-4. ^ a b c Remembrances: 100th Infantry Battalion 50th Anniversary Celebration 1942-1992. 100th Infantry Battalion Publication Committee. 1992. ^ "Keynote Address by Young O. Kim". 100th Infantry Battalion Veterans. 3 July 1982. Retrieved 17 August 2012. ^ "France". 100th Infantry Battalion Veterans. 23 March 1945. Retrieved 17 August 2012. ^ a b "The 100th/442nd, The "Champagne Campaign"". www.goforbroke.org. Retrieved 2018-06-12. ^ "Southern France". history.army.mil. Retrieved 2018-06-12. ^ Axelrod, Alan (2007). Encyclopedia of World War II. H W Fowler. p. 476. ISBN 978-0-8160-6022-1. ^ "Central Europe Campaign – 522nd Field Artillery Battalion". Archived from the original on 3 February 2015. Retrieved 2015-01-12. ^ "The 522nd Field Artillery Battalion and the Dachau Subcamps". Go For Broke NEC. Retrieved 2015-01-12. ^ Ready, J. Lee. (1985). Forgotten Allies: The Military Contribution of the Colonies, Exiled Governments and Lesser Powers to the Allied Victory in World War II. Jefferson, North Carolina: McFarland & Company. ISBN 978-0-89950-117-8. ^ Ready, J. Lee (1985). Forgotten Allies: The European Theatre. Jefferson, North Carolina: McFarland & Company. ISBN 978-0-89950-129-1. ^ Williams, Rudi. "22 Asian Americans Inducted into Hall of Heroes". American Forces Press Service. Retrieved 23 December 2015. ^ "Nisei Veterans French Legion d'Honneur Award Ceremony" (PDF). Retrieved 26 December 2016. ^ "Go For Broke". Go For Broke. Retrieved 11 January 2018. ^ Yenne, Bill (2007). Rising Sons. New York, N.Y: Thomas Dunne Books. pp. 247–252. ISBN 0312354649. ^ Tang, Edward. "From Internment to Containment: Cold War imaginings of Japanese Americans in Go for Broke". www.columbia.edu. Retrieved 2018-06-12. ^ a b Pullen, Colonel Randy (22 April 2008). "Army Reserve Marks First 100 Years". U.S. Army Reserve 100th Anniversary website. United States Army. Retrieved 28 February 2018. ^ Michael Dale Doubler (2008). The National Guard and Reserve: A Reference Handbook. Greenwood Publishing Group. p. 133. ISBN 978-0-275-99325-2. Adams, Paul (20 August 2004). "Samoan Reservists answer the call to duty". Army News Service. Pago Pago, American Samoa. Retrieved 28 February 2018. ^ Kakesako, Gregg K. (29 May 2005). "'Go For Broke' on daily combat missions". Honolulu Star-Bulletin. Retrieved 28 February 2018. ^ Kakesako, Gregg (17 March 2005). "Isle battalion commander fired after altercation in Iraq". Honolulu Star-Bulletin. Retrieved 28 February 2018. ^ Kakesako, Gregg K. (4 January 2006). "Attack in Iraq targets 100th Battalion camp". Honolulu Star-Bulletin. Retrieved 28 February 2018. ^ "Army Staff Sgt. Frank Tiai". Military Times. Vienna, Virginia. Associated Press. 17 July 2005. Retrieved 28 February 2018. ^ "Island Military Heroes". Office of Insualr Affairs. United States Department of the Interior. Retrieved 1 March 2018. ^ a b "100th/442nd Reserve Unit". 100th Infantry Battalion Veterans Education Center. 100th Infantry Battalion Veterans. Retrieved 28 February 2018. Cole, William (14 July 2005). "Isle troops track down suspects, arms cache". Honolulu Advertiser. Retrieved 28 February 2018. ^ "100th Battalion on alert for possible Kuwait deployment". Honolulu Advertiser. 21 December 2007. Retrieved 28 February 2018. Stewart, Richard W. (26 August 2015). "Lineage and Honors". Center of Military History. United States Army. Retrieved 1 March 2018. ^ Watanabe, Teresa (December 21, 2007). "Seeking stamp of approval". Los Angeles Times. Retrieved June 23, 2016. ^ Kakesako, Gregg K. (19 May 2008). "7,200 more Hawaii-based troops heading out". Honolulu Star-Bulletin. Retrieved 28 February 2018. ^ Carpenito, Sergeant Crystal (January 2009). "29th Infantry Brigade Combat Team uncases their colors" (PDF). Lava Flow. Hawaii Army National Guard. Retrieved 28 February 2018. ^ "100th Battalion, 442nd Infantry Regiment Soldier Honored in Memorial Ceremony at Camp Virginia". Defense Visual Information Distribution Service. Defense Media Activity. 29 June 2009. Retrieved 28 February 2018. Congressional Record. St. Martin's Press. p. 13120. Lee, Major General Robert G.F. (2009). "Annual Report Fiscal Year 2009" (PDF). Department of Defense. State of Hawaii. Retrieved 28 February 2018. ^ Zeisset, Capt. Timothy (June 2009). "100-442nd IN: Soldiers drive one million miles" (PDF). Lava Flow. Hawaii Army National Guard. Retrieved 1 March 2018. ^ Livesay, James (1 July 2009). "USCIS Naturalizes 84 Members of U.S. Military in Kuwait Ceremony". Livesay & Myers. Archived from the original on 2 March 2018. Retrieved 1 March 2018. "USCIS Naturalizes 84 Members of U.S. Military in Kuwait Ceremony" (PDF). Global Law Centers. 29 June 2009. Retrieved 1 March 2009. ^ "Takashi "Halo" Hirose". ISHOF.org. Retrieved 2018-07-05. ^ "Champion swimmer Takashi 'Halo' Hirose dead at 79 | The Honolulu Advertiser | Hawaii's Newspaper". The Honolulu Advertiser. 2002-09-04. Retrieved 2018-07-05. ^ Williams, Rudi. "Army Secretary Lionizes 22 World War II Heroes". American Forces Press Service. Archived from the original on 28 October 2012. Retrieved 1 September 2012. ^ Associated Press (Chicago), "Keynoter Knows Sting of Bias, Poverty", St. Petersburg Times, August 27, 1968. ^ Scott, John L. (3 October 1967). "Japanese Actor No Longer Villain". Los Angeles Times. p. C1. ^ Chang, Thelma (November 1985). I Can Never Forget: Men of the 100th/442nd. Honolulu, HI: Sigi Productions. ISBN 0-9630228-0-6. ^ Ingram, Scott (2006). Korean Americans. World Almanac Library. p. 27. ISBN 978-0-8368-7315-3. ^ "About USIP: History: Selected Biographies: United States Institute Of Peace". Archived from the original on 9 July 2008. Retrieved 23 September 2008. ^ Aoki, Huy (28 July 2011). "Into the next stage: The 100TH/442ND acknowledged in 'Captain America'". Rafu Shimpo. Archived from the original on 26 February 2018. Retrieved 25 February 2018. ^ "Valor With Honor". Retrieved 1 September 2012. "Americans of Japanese Ancestry World War II Memorial Alliance". Archived from the original on 16 May 2007. Retrieved 5 September 2007.